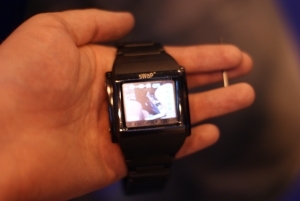 sWaP (Smart Watch and Phone) had their watch on display at Gadget Show Live and we had the chance to have a quick look at it. First impressions of the sWaP Watch is that it’s a fairly chunky device that raises quite far off your wrist. The face measures 5cm x 4cm. It has a 1.5 inch TFT colour touch screen that allows you to control the functions of the watch, phone and display video for playback. A SIM card is not included with this phone as you buy it off contract. Memory capacity of the sWaP is 512MB on board which can be bumped up another 2GB by using a trans-flash drive. With the screen measuring just 1.5″ it makes the icons rather small which means a stylus is provided. The stylus is tiny measuring about an inch long although it does extend slightly. To make calls you can either use a hands-free kit or you can make use of the Bluetooth headset. The BT headset is included. MMS and SMS messages can be sent and received. The sWaP also has a small camera built in the side to capture photos. Overall a fairly feature packed wristwatch phone but it is let down by it’s shear size. The staff at the booth said a new slimmer model was due out sometime this year though so hopefully they can get the new one looking a bit better.